Do you live in Howick? Moore St was named after General Sir John Moore, a British military hero, who lived from 1761-1809. General Moore fought against Napoleon alongside Sir David Baird for whom Baird St was named and he (Moore) died at Corunna during the Peninsular War whilst serving under the Duke of Wellington. At Corunna he was attended by Dr J. Bacot, father of the Howick Fencible doctor, who lived in Bleakhouse. Moore St was part of the original Fencible village and was sub-divided into one acre (4,000 m²) allotments down to Rodney St. People will, no doubt, recognise that Wellington and Nelson Sts spring from the most famous of British war heroes, Lord Nelson and the Duke of Wellington and that Selwyn St takes its name from the first Bishop of New Zealand, George Augustus Selwyn. Then there are streets such as Granger Rd named for John Granger, manager of the brick works, which once stood at Little Bucklands Beach near the rock outcrop where the Bucklands Beach Centre board clubrooms now stands, before moving to Whitford. Litten Rd and John Gill Rd are named after former farmer and landowner families. Irishman John Gill settled in Howick in the 1850s, and his family farmed the land that is now Cockle Bay and Shelly Park. Litten Road is the boundary of the one of the old Gill-Litten farms. To the north of Picton Street, the main street of Howick, is Stockade Hill. 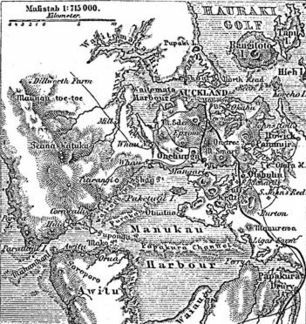 In 1863 a field work was constructed on what is now called Stockade Hill, for the purpose of defending Auckland from hostile Māoris who might advance overland from the south, or by canoes from the Firth of Thames. The ditches of the stockade can still be seen today. In the centre is a war memorial were services are held each ANZAC Day. The top of Stockade Hill provides uninterrupted views in all directions. 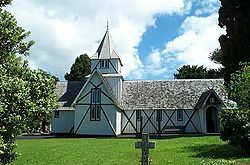 The 1930s saw the construction of a concrete all weather road running all the way from Howick through Pakuranga to Panmure. This allowed the rapid passage of people and goods to and from Auckland. This concrete road can still be seen, in parts, on the highway between Howick and Pakuranga.